They won’t let this go. They won’t give up on this promotion push. They won’t allow this season to die. And now they are right back in it. A major plot twist, one that you couldn’t see coming. Bloodied and bruised on Tuesday, but straight back up off the canvas here. There was no laying down of arms. A complete absence of any white flag. The fat lady has been told to sit down and shut up. Who’s tired now? 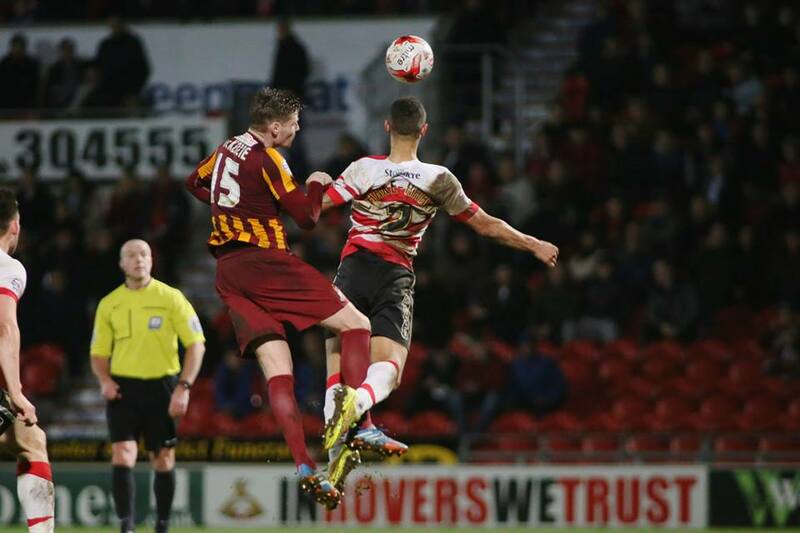 From down and out, Bradford City suddenly look fresh and broad-shouldered. The swagger has been rediscovered. This was their best performance for weeks. Their biggest league victory of the season. For as bad as they collectively were on Tuesday, this was the complete opposite. To a man, they stood up to be counted. They were magnificent. And their reward is to move back to centre stage in the League One play off race. For all the tedious debate over the last 72 hours about the lack of a Plan B, Phil Parkinson’s detractors probably have a point when it comes to away games. Going right back to his early weeks in charge in 2011, the formula has rarely changed. Under Parkinson on the road, City attempt to slow down the tempo in the first half, and at the very least go in at the interval on level terms. And then in the second 45, they up it and invariably finish games stronger than they started them. It hasn’t always proven a successful strategy and – prior to this season – Parkinson’s away record offered little to shout about, but it has worked well this season. And it especially worked well tonight. That the first half was a dreary affair is missing the point of what Parkinson and City did to Doncaster. The home side were supposed to have the greater energy after nearly two weeks without a match, but City ensured that Doncaster couldn’t rediscover their rhythm. They made them look rusty. There were some similarities to Chesterfield’s approach at Valley Parade midweek, only more attacking intent was shown by City. Going in 0-0 at half time with only a long range Craig Main effort that smacked Ben Williams’ post to worry about, the visitors had their hosts right where they wanted them and were poised to strike. It was like that old secondary school trick of sneaking up behind a classmate who is stood up and taking their chair away from behind them. You then watch the victim’s self-assurance disappear as they go to sit back and realise with horror that they are falling straight to the floor. Doncaster would have been satisfied too at half time, but their big second half push never happened. City suddenly stepped it up, kicked away their play off rival’s chair, and in a flash were 2-0 up. Rovers sat dazed and confused on the floor. There was poetic justice that Gary MacKenzie got the ball rolling with the opening goal from a corner. 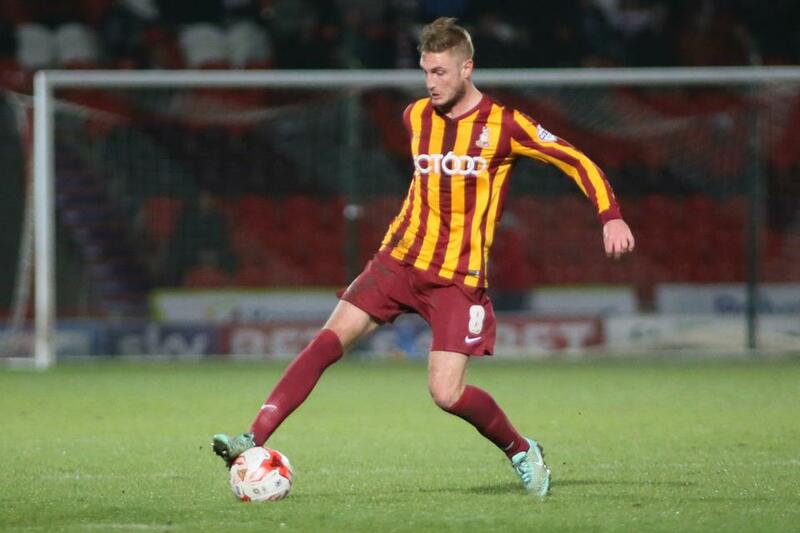 MacKenzie gifted Chesterfield their winner on Tuesday but quickly made amends here with his first Bantams goal. He took an almighty wack for his troubles, but even sore limbs won’t have hurt as much as the previous 72 hours of mental anguish. This was an assured display from the on-loan defender, one that takes him closer to earning a permanent deal at Valley Parade and that, by the same token, pushes Andrew Davies towards the exit door. Doncaster responded quickly to the goal with Dean Furman forcing a superb tip over the bar from another of Tuesday’s maligned characters, Ben Williams. The importance of this save was magnified by City quickly going 2-0 up. The visitors were happy to play counter attack football and wait for opportunities. From such an occurrence James Hanson was played through one-on-one, seemed to lack the confidence to shoot and so laid the ball off to Billy Clarke, who finished emphatically. 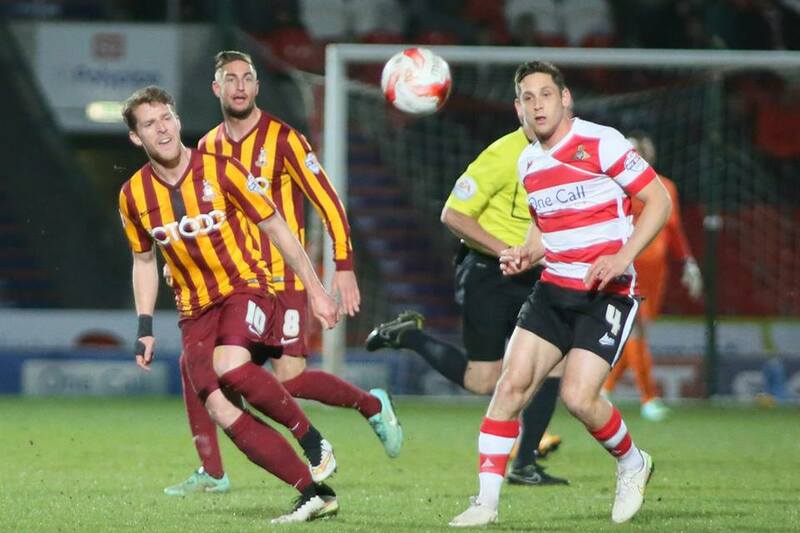 There was no way back for Doncaster. Manager Paul Dickov shuffled his pack, but his players couldn’t get to grips with City and never managed to work up a head of steam. The game was seen out in remarkable comfort, with a third Bantams goal even added in injury time after substitute Tony McMahon took advantage of a home slip to run through and finish coolly past Stephen Bywater. It led to all the City players racing over to the dugout to hug substitutes, coaching staff and their manager. A public demonstration of the team ethic that was the catalyst behind this victory. Perhaps Dickov was caught out by Parkinson’s surprise move back to a conventional 4-4-2. For all the bad press the diamond formation unfairly gets, even its most ardent critics in the stand agree that it has worked effectively on the road. Tonight City looked as rigidly 4-4-2 traditional as at any time in the history makers season. They lack a striker like Nahki Wells to play on the shoulder of the last man, but have the workable alternative of Clarke dropping deep into space, to take advantage of Hanson’s knock downs. Clarke is everything Alan Connell threatened to be and more. He looked such an uninspiring summer signing but has been amongst the best. How on earth could he not get into Crawley’s team a year ago? Hanson is not in his best form but benefited from Jon Stead’s demotion to the bench and restoration to the target man role. He was excellent here. And the two lines of four behind Clarke and Hanson were outstanding. We know what to expect from the back four and they continue to rise to the challenge of coping without Davies. On the flanks Mark Yeates and the returning Filipe Morais played out their manager’s instructions of being compact off the ball and creative on it. But the star men here were in the centre of midfield. Gary Liddle and Billy Knott ran the show. They were the tempo setters, intelligently knowing when to keep it steady and when to increase the pace of the game. They protected their back four and were the instigators of attacks. They bossed the centre of the park, demoralising a talented Doncaster midfield that included former City loanee favourite Furman. It was no small achievement. It is curious, but we have got to this late stage of the season without talking much about the partnership of Liddle and Knott. The diamond approach has meant the pair have not sat alongside each other too often, with one usually higher up the pitch than the other. Even when Parkinson went to 4-4-1-1 in November, Andy Halliday was favoured over Knott to partner Liddle. But here they were side-by-side, and here was the present and the future of Bradford City. They complement each other well and provide the team with an encouraging balance. This could be something really special, something greater even than Jones and Doyle. Time will tell if the diamond is now consigned to the bin or revitalised before the season is out (I suspect the latter), but for now the pair deserve to go again in this way. Knott was awarded a standing ovation when he was substituted late on, and the way he has been gradually developed by Parkinson over the season is his man management approach at its best. Too much weight was placed on Knott’s young shoulders earlier in the campaign and he was suffering. So Parkinson put a stop to that, and then over recent months has gradually increased Billy’s responsibilities again. Knott is a better player for this approach; he has proven to be some signing. With the home stands emptying long before McMahon’s gloss-sealing third goal, the Keepmoat was pretty much home only to City fans at the final whistle. The celebrations were memorable. The joy of being here to witness such a remarkable night will be treasured for a long time. Triumphs like this are what we have come to expect under Parkinson, but should never be taken for granted. You’ve got to really enjoy these good times. We’ve had too many of the other kind. The play off fight looks more winnable than it did prior to kick off, where news of Chesterfield’s 3-2 victory over Yeovil earlier in the day had been digested. Had City not won here, it might have been all over, but the fight goes on and you wouldn’t bet against this group of players taking it right to the wire. With special thanks to Thomas Gadd for allowing us to use his brilliant photos. Please visit Thomas Gadd’s website for more details or here to view more photos of this game. Great report, as ever, thought our fans were excellent last night, about 2,500 travelling supporters. According to the stats, there were 6,000 home fans, which I find hard to believe. Granted last night we were set up differently from Tuesday night but the difference between the 2 games ….chalk and cheese . Why can’t City play like this in home matches ? 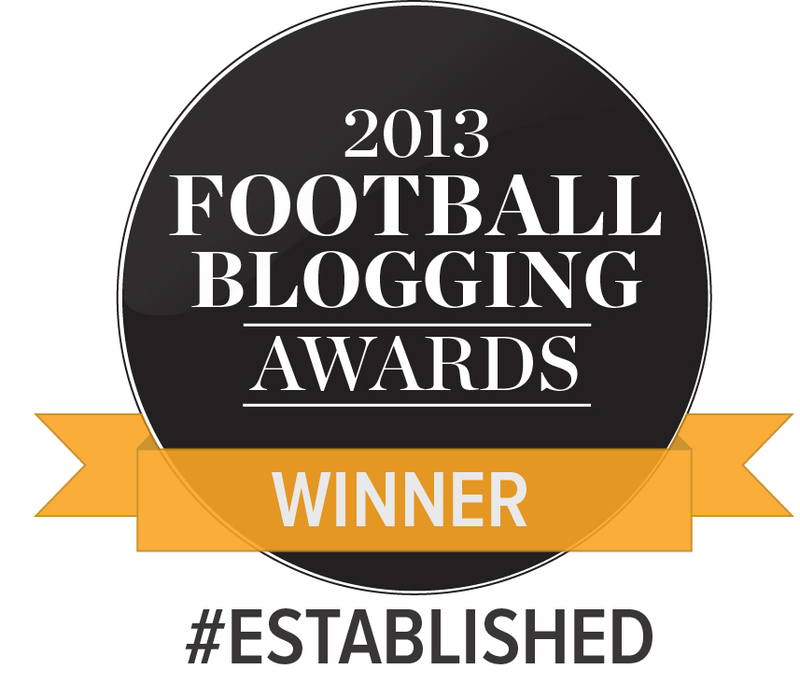 Great match report, as always, and what a superb display, especially second half from Bradford. Hard to pick a man of the match but perhaps Big Mac just shaded it with the crucial first goal and winning everything in the air all night. He’s proving to be a very good signing (Tuesday slip aside). I also thought the fans were fantastic.